Liza's Eyeview: Hope Chapel on Maui Celebrates 27 Years! Hope Chapel on Maui Celebrates 27 Years! 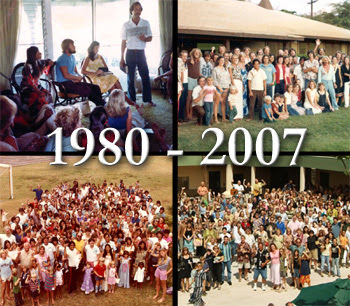 I have attending Hope Chapel for 14 years, and that's how long I had been on Maui. Hope started started 13 years before I arrived here - and on Sunday, we are celebrating it's 27th Anniversary. This inspired me to reflect on the reasons why I love coming to this church, and why I am thankful for it. Awesome Worship. This is my favorite part of the Sunday Service. Even though I am not a singer, and I can't carry a tune, I can sing to my heart's desire and I can sing freely for God. I like the worship songs that we sing at Hope. Many are contemporary, sometime hymns, but mostly really focused on just praising and worshiping God. I love it that I can raise my hand freely and no one will be offended (at least none that I know of), but I also can be just still and quite and no one expects me to raise my hand all the time. Solid Biblical Teaching. We are blessed with pastors and teachers who teaches from the Word of God. Pastors and teachers who are inspired by he Holy Spirit to preach the Word. I love it that each of our pastors have a unique style and not one is a clone of another. The teachings at Hope are profound yet relevant, Biblical yet practical, serious yet humorous at times - all in all, it motivates me to be a better person for Christ when I get out. Excellent Children's Ministries. For families with kids, this alone is a great attraction. Hope cares about our little ones. Children ministries expands from Nursery to Tweens. Toni and her childrens ministry staff and volunteers works so hard to ensure that our kids gets the best possible teaching and fun at church. I know I can go on and on about how excellent this ministry is but for the sake of time (yes, my blogging time is almost over) - I'd just say, children's ministries at Hope rocks! 27 years ... and still counting. Happy Anniversary Hope Chapel, I am very thankful for you! If you live on Maui and a reader of this blog but has not been at Hope, i invite you to come this Sunday. Join us for a celebration service like no other with worship, hula, special guests, food court, and an inspiring message. We'll have two services - 8:30am and 10:30am. See you there! I was planning to post this yesterday for Thankful Thursday but I didn't get a chance. I guess I can still enter this. To for thankful hearts, visit Sting My Heart here. I also included in Works of God Weekend Carnival. Visit A Dusty Frame for more posts on God's works and blessings. Beautiful blessings to you sweet one. wow thats a long time to belong to one church. It's so good to have a church that you love! It looks like the church continues to grow - at least that is what the picture looks like. That is a good sign of a "living" church. Blessings as you celebrate and enjoy our church family! Hello, my name is Anna and I attended Hope in 1989-1991 during my stay with Mark & Jori Spencer (I was their au-pair). I tell you, it was good even back then in the beginning and they lead my on the right path. I try to keep up with what´s happening, and I am glad you are growing. Did I tell you I live in Sweden? !